Now that we’re fully in the grips of winter, the last thing you want is to have your car break down and leave you stranded by the side of the road. Rather than take run the risk of having to wait for roadside assistance to make it to you during terrible weather, take the initiative and bring your Ford car, truck or SUV to the Service Center at Reynolds Ford of Norman. Checking the battery, wires and spark plugs. Extreme temperatures can finish off an already-weakened battery, so winter weather can be extremely tough on an older battery. We also make sure that your spark plugs are firing properly, and that all wires are connected and not loose. Changing your oil and topping off all other essential fluids. You definitely don’t want old, sludgy engine oil in winter, since low temperatures can already make your oil more viscous. Since you’re likely to be using your wipers more often in storms, it’s essential that your wiper fluid reservoir is filled, and your antifreeze level always needs to be maintained. Examining all lights to make sure that they’re working properly, since winter offers fewer daylight driving hours. If any bulbs are burned out, we’ll replace them to ensure maximum visibility. Assessing your tires to ensure that you have sufficient tread and that they’re inflated to the recommended PSI. 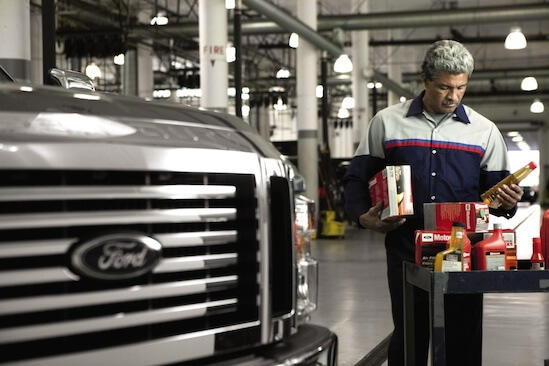 Since our service technicians are factory-trained by Ford, you can trust them to maintain and service your vehicle according to the highest standards. If any parts need replacing, rest assured that only genuine Ford parts are used — so you know that they’ll fit as originally engineered. At Reynolds Ford of Norman, we’re proud to deliver excellent service to our customers from the Oklahoma City, Mustang and Blanchard areas.